Item-Level Pricing Control in One Simple Package. 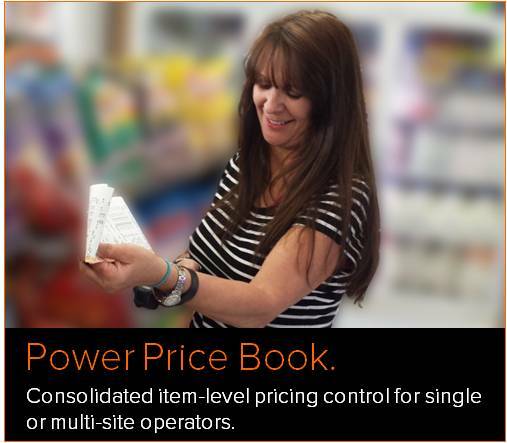 Power Price Book is designed for retailers whose primary focus is exerting item-level pricing control over their operation. It is fast and easy to deploy. You can be up-and-running with it in a manner of hours. Update Item Prices from a Single Location. Select up to 11 different criteria options on which to filter items for price changes. If desired, you can save and re-use criteria if you run the same promotions repeatedly. Select the type of price change to be applied to the selected items. You may also move items to a new department. Apply changes across the site with a few clicks of the mouse. Send Price Changes to Your POS System. After you make price changes, send them to your Point-of-Sale (POS) using our POS Interface software. Bringing down registers for item price updates is no longer required, reducing disruptions to your business. Accurate price scanning at the POS can’t occur unless retail prices are kept current. Power Price Book handles this and goes one step further: you can print bar code labels for newly priced items. Update your shelves in the timliest manner; focus on engaging the customer and improving their shopping experience without worrying about outdated shelf prices. In addition to Item Adjustment and the POS Interface, Power Price Book provides other useful features including the ability to print inventory lists, a Hardlock Adapter for software security, and a wedge scanner.